UNIMAID Remedial form for 2014/2015 admission application for both Arts and Sciences is out. 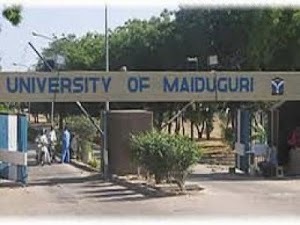 The University of Maiduguri remedial programme admission application forms for the 2014/15 session are available at designated banks in Nigeria. Applications are invited from suitably qualified candidates for admission into Remedial Arts and Science programmes. (a) The admission requirement is 5 credit in SSCE, GCE or NECO in not more than two sittings. The credits must include English and Mathematics and three other subjects relevant to chosen Remedial Programme (Arts or Science). (b) Candidates must seat for the 2015/2016 UTME examination and must obtain a minimum of 180 points. Payment of three thousand Naira only (N3,000.00), for the purchase of the forms must be made through the University’s Account NO: 030401455 with the Unimaid Micro-Finance Bank, University of Maiduguri Bama Road Maiduguri or Account No: 0004966204 of the Diamond Bank Plc. The Bank teller is then presented to the Bursary Department for issuance of receipt, which would be used to collect the application forms from the Admissions Office. The application forms would be available as from 30th June,2014. Completed UNIMAID remedial application forms must be returned to the Admission Office by hand, registered post or by mail not later than 31st August, 2014. The following documents must accompany each application form. NB. (i) Successful Student admitted for the 2014/2015 session will be placed into part one in 2015/2016 Session. (ii) The University is not obliged to give reasons for the rejection of any application and will not enter into personal correspondence on the matter. That's all you need to know about UNIMAID Remedial Form For 2014/2015 session.